* Polished Finish Some Mustang enthusiasts consider handling performance more important than horsepower and torque. When Lowering ANY car it will affect the alignment of the tires and the geometry of the suspension  to correct it  we highly recommend the use of Caster Camber plates. These high quality BBK CNC polished billet aluminum Mustang Caster camber plates are available to fit all 79-93 and 94-04 Ford Mustangs. 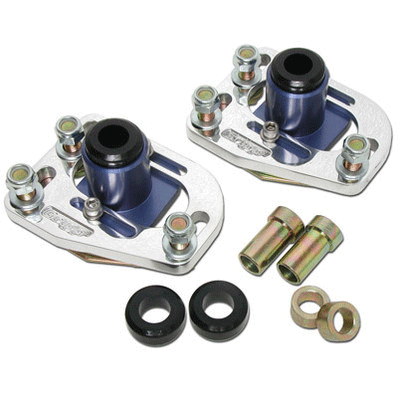 These BBK caster camber plates will allow you to correct your front end alignment to prevent premature tire wear, but most important of all they will allow you to adjust the caster and camber of the front struts to considerably improve the way your car will turn into corners flatter and be considerably more responsive to steering input overall. They will turn your car into a real corner carver. Click Here for Instructions No one else can Stack up to the bold clean styling of our aftermarket Billet / Stainless Steel Dress Ups, Street / Strip / Racing Suspension and Performance Parts for your American Muscle Car! Fits these Vehicles: 1979 1980 1981 1982 1983 1984 1985 1986 1987 1988 1989 1990 1991 1992 1993 V8 GT LX 5.0L 302 Mustang Steeda Roush & Saleen Vehicles.